My family loves to eat soup. 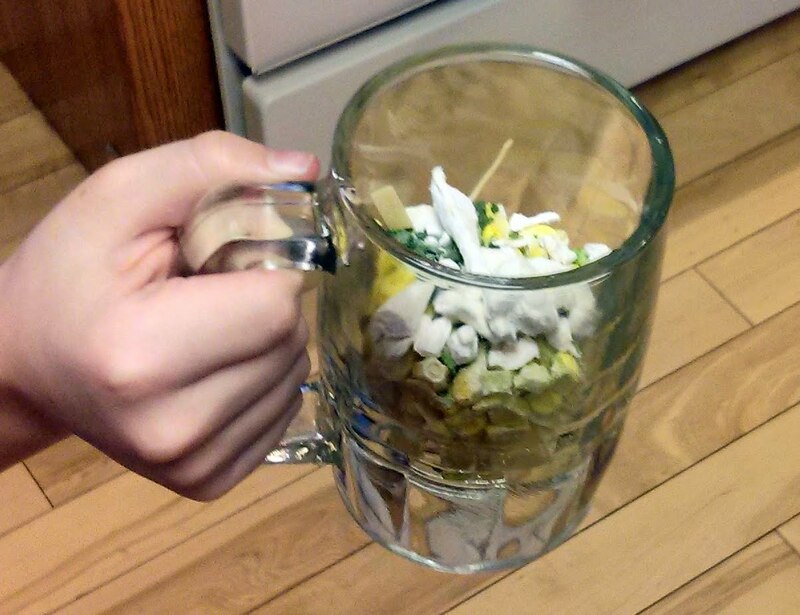 A while back I heard of the idea of making soup in a mug, with food storage ingredients. So I gave it a try and my kids loved it. There is almost no prep work and you can be eating dinner in about 10 minutes. Everyone gets to design their own soup so there is no complaining about ingredients (like onions) that are offensive. Since that first time we have made this meal often and it is always a hit. Large mug for each person. I used large clear glass mugs but you can use whatever you have. My mugs hold 16 ounces or 1 cup. Hot Water-about a cup per person. We have an electric tea kettle and I fill it up and turn it on, then once the mugs have the dry ingredients in them it is easy to pour water over the top. * If you choose to use the instant beans, instant rice or egg noodles be sure to wait the full 10 minutes for them to soften and cook. My kids are pretty impatient so I usually don’t have them add those ingredients to theirs. Add your ingredients, you are aiming to have the mug 1/3 to ½ full of Freeze dried ingredients.